On a typical grey and rainy London sky, our first stop brought us to the home of Fulham Football Club; the iconic Craven Cottage. We couldn’t ask for a more appropriate venue and weather conditions for our first visit: a real immersion in English football and steps into the history books, especially when visiting one of the oldest football stadiums in the city, built towards the end of the 19th century, and home of the local club since 1896. Located on the bank of the river Thames, it is barely recognizable as a football stadium; from the outside, its Johnny Haynes Stand, originally called Stevenage Road Stand, is built with the traditional red bricks that distinguished the neighborhood. Someone could easily pass by and not even know there is one of the most iconic London football grounds behind these walls. It is important to remember that this historic stand is more than 100 years old, dating back from 1905. Our morning was perfectly orchestrated; on our way to the meeting room, we had the honor to walk on the side of the pitch, giving us the first taste and smell of a true English football ground. 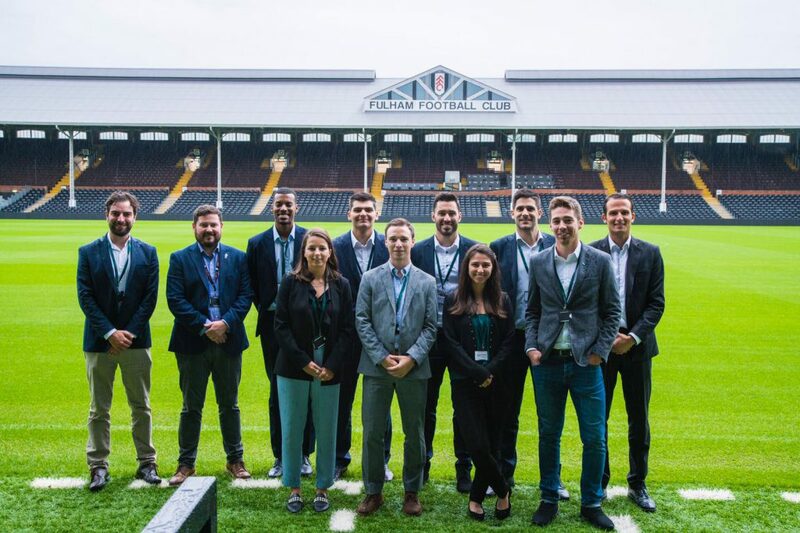 We were then welcomed by the management team of Fulham FC, who gave us a deep overview and understanding of the club’s positioning and vision for the future, as well as its importance and impact toward the communities. Darren Preston, COO of the club, presented the new development plans of the Riverside Stand. Increasing the total capacity of the stadium by 4’300 seats, the new modern stand would be the crown jewel of the future of the stadium. Built alongside the river Thames, the plan would be to host state of the art F&B facilities, sports entertainment centers, apartments to rent on an “AirBnB” type of models, as well as a swimming pool and other amazing features. It would definitely re-energize the neighborhood, with the stadium being the beating heart of the area, and one of the best viewpoints in the future for the famous Boat Race, between Oxford and Cambridge taking place in front of the stadium. Due to be completed by 2021, this new project will definitely bring up more and more opportunities for the club to position itself towards its existing and new partners, and is the exciting challenge that George Alston will manage with his team. But a football club is much more than just football and what is happening in its stadium. The impact to the communities and the responsibilities it has towards the different generations is huge. It is the vision and mission of the Fulham Football Club Foundation, to use the power of sport to build better lives through sport. With 5 main themes including Education & Training, Health & Wellbeing, Sport in the Community, Sporting Pathways, and Inclusion, the charity foundation led by Mike McSweeney, delivers programs and activities to around 12’000 participants per seasons. 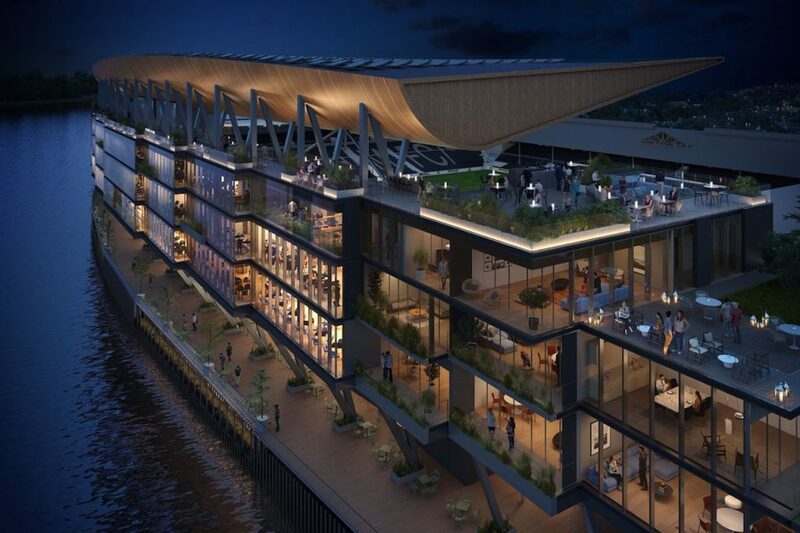 The Riverside Stand will be the crown jewel of the future at Craven Cottage. Following this insightful understanding of how a historic Premier League club differentiates from the modern cash injected clubs that are known today, we couldn’t leave without a full visit of this historical venue. Built in 1896, Craven Cottage is recognized to be the oldest football ground in professional English football, and one to offer one of the best atmospheres during a football game. The stadium has 4 stand-alone stands, as well as the Cottage Pavilion, to be the seating area for the players’ family and friends (as well as the changing rooms). From the wooden bench on the Pavilion’s stand to the gateways of the Johnny Haynes stand, you could really feel the history in every corner of the stadium. It is then that you realize the importance of historic values that supporters really believe in and proudly defend against modern minds from other clubs. For a Premier League club, Fulham Football Club is the true definition of history. Our next stop brought us a few kilometers away, to Stamford Bridge the home ground of “The Blues” – Chelsea Football Club. Like Craven Cottage, the stadium was built at the end of the nineteenth (19th) century by the famous stadium architect designer Archibald Leicht, but unlike the Fulham FC home ground, it received several renovations throughout its history (the latest being in 1998), leading to its actual shape. The interesting story is that in 1904, the owner of the stadium offered the ground to Fulham FC, who refused over some rent disagreements. This refusal saw the owner created his own football club to play at Stamford Bridge, The Chelsea Football club, 6-times winner of the English Premier League. The redevelopment of Stamford Bridge has been delayed due to several issues over the past years. For this visit, we were warmly welcomed by Adam Burrage, the Stadium tour and Museum Manager of the club. We had the honor to enjoy the afternoon with him for a private tour of the facilities, filled with interesting stories about the club and the stadium. We started in the Museum, in front of the new development plans of the Stadium, where Adam explained to us the situation of the stadium, and the challenges faced to develop a new stadium on the same location of the existing one. It’s been a few years that the club has decided to upgrade their venue to a modern and bigger stadium; it would not only bring additional revenue opportunities to the club, but it is also important for “the pride of London” to enhance its brand and its image with a state of the art stadium. But things are not that easy. And especially in a city like London, where space is lacking. 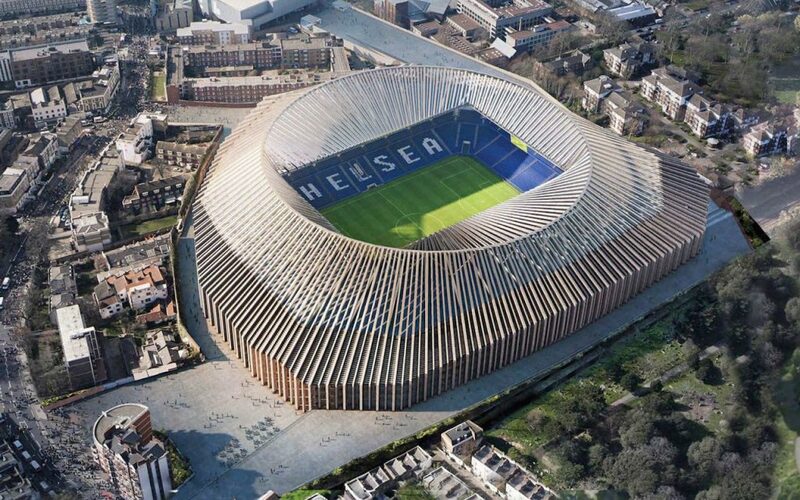 Although Chelsea Football club benefits from the financial power of its owner, transforming or rebuilding Stamford Bridge has been filled with difficulties. Its location and the metro lines below, the local communities and the lack of space in the area. The plans have been approved, but with all these challenges, the redevelopment of the stadium is now on stand-by. It will take a few years before we see The Blues playing in their new stadium. The rest of the tour brought us to the various parts of the stadiums, where we would see various staff and workers getting ready for their first home game of the season, the local derby against Arsenal FC. They only had a few days left before the game, and still had a lot of work, especially to remove all the visuals of Thibaut Courtois, who left for Real Madrid CF a few days before our visit. The next day, we continued our London tour with the visit of Emirates Stadium, home of another famous London club, Arsenal Football Club. It was the perfect day for such visit: August 17th, the birthday of one of the club’s legend, and one of my teenage years’ hero, Thierry Henry. Arriving at the stadium the two canons in front of the megastore cannot go unnoticed. These cannons have two purposes; to enhance the club’s emblem to all visiting fans, but also, to act as barriers in case of any attacks. We then had a quick tribute to Thierry Henry’s statue before joining our hosts Neil Stocker and Jaime Conroy for our private tour. A look inside Puma’s corporate hospitality box at Emirates Stadium. Although the stadium is beautifully designed, it will not match the personality and feel of a historical stadium like Craven Cottage. Unfortunately more and more clubs are transforming their stadiums into cash making venues, and loosing their historical identity. The last stadium of our trip had to be the biggest; with 90’000 seats capacity, Wembley Stadium is, by capacity, the biggest stadium in UK, and the second biggest in Europe (after Camp Nou in Barcelona). Built in 2007, it replaced the old Wembley stadium (1923-2003) that was the jewel of English football and home of the national team. This new Wembley is the perfect example of transforming a historical stadium into a modern facility. There was no doubt that the old Wembley was old, and was getting too expensive to maintain, and that the Football Association (the FA) needed a new stadium for their National team, there were still a lot of complaints regarding the construction process, its cost, and its new design. At nearly £ 800 million, the new Wembley lost all its charm from the past, and especially, lost its 2 twin towers that had become the icon of the stadium. Let’s not be too critical, it is a beautiful stadium. Its enormous 134m arch supporting most of the roof load, the Wembley Arch, is becoming one of the landmarks across London. Who knows the historical value it will have in 80 years with the future generations, but certainly the structure will remain one of the most important football venues in the country. The highlight of our tour was the interaction with the official replica of the famous FA Cup, which is handed to by the Queen of England to the winner of the FA Cup competition. The last day of our visit, we had the opportunity to come back at Wembley Stadium, but this time, to enjoy a match day experience. It was the first home game of the Spurs this season, hosting Fulham FC. We were impressed by the efficiency of the crowd management, able to get 80’000 fans in the stadium very smoothly. The game ended 3-1 for the home team, with Harry Kane scoring his first August goal of his Tottenham career. Henri Boppe is an alumni of The FBA’s Professional Master in Football Business, graduated in September 2018. He can be contacted via LinkedIn.